I don’t know whether or not you folks believe in divine intervention, but when things like this happen, it’s hard to come up with another explanation. 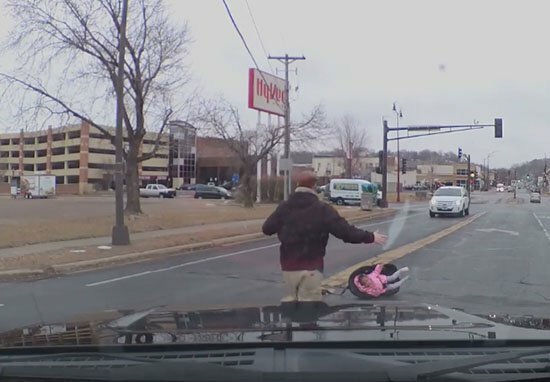 Shocking dashcam footage shows the moment a two-year-old girl was flung out of a moving vehicle in her car seat. 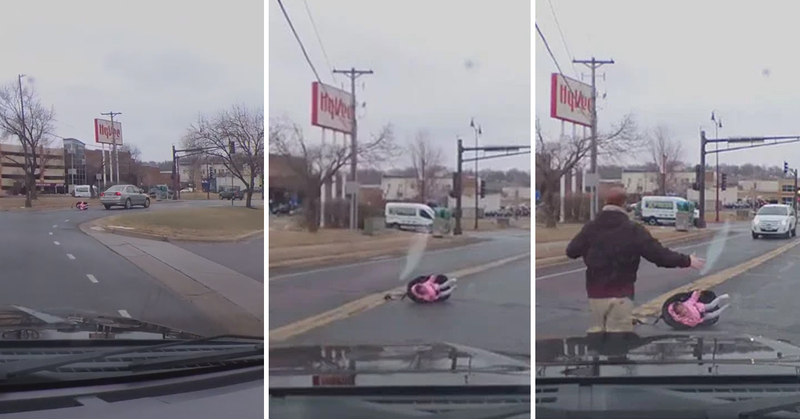 The shocking incident took place in Mankato, Minnesota, and was captured on another driver’s dashcam as he traveled behind the vehicle in which the little girl was travelling with her parents. Facebook user Chad Cheddar Mock posted the video to social media shortly after it had happened, expressing his shock at the events that had unfolded. The little girl can be seen falling out of the left rear door while the car drives round a corner at approximately 11:45am. 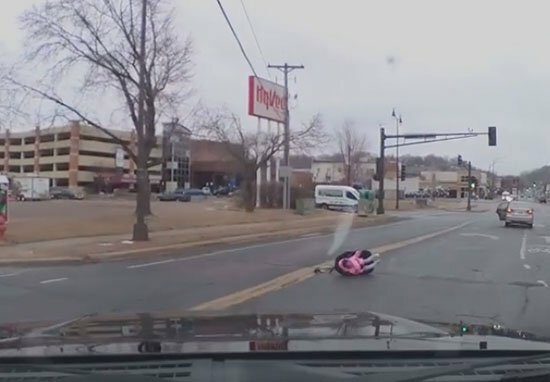 The two-year-old is wearing a pink jacket and grey tights as her car seat topples out of the car and lands on its side in the center of the road. With the parents seemingly oblivious to what has just happened, the car she was in then drives off down the street, while multiple people stopped to get the little girl to safety. Police said the toddler was properly fastened into her car seat, but the seat itself had not been fastened inside the car correctly, which led to it coming loose. It is not known how the car door managed to fly open, but it’s possible that the child opened the door with the inside handle. What’s even more amazing about this story is how long it took the parents to notice. The girl’s mom reportedly returned to the scene 20 minutes later, when she realized her daughter and the car seat were missing from the backseat. It is reported that police have asked the Blue Earth County Attorney’s Office to consider charging the mother with child endangerment by not properly fastening the child restraint system. However, in comments underneath the video Mock mentioned that the parents were allowed to take the little girl home with them with no further action. The video has been shared far and wide – not surprising considering the shocking nature of the footage. At the time of writing, the video has been viewed almost a million times. People immediately began to praise Mr. Mock for his quick thinking, calling him a ‘life saver’ and noting how lucky the child was that he was around to witness the incident. Fortunately, despite the dangerous fall, the little girl did not incur any injuries in the fall, since she was strap tightly in the seat, and the seat landed fortuitously. Thank God for that!